Fantasy Flight’s Android: Netrunner has dominated my time and thoughts more than any other game the last few months. In fact, I don’t know if I’ve ever been so obsessed with a game in my entire life. Even though I’ve only been playing the game for a few months now, rarely a day goes by that I’m not reading about strategy, working on refining my decks, or playing games, either online or in person. I’ve even dreamt about Netrunner. Sadly, the deck idea I dreamed about turned out to be awful. How has this game captured me so completely? What drove me to spend hundreds of dollars amassing cards? Well, to be blunt, the game is brilliant. 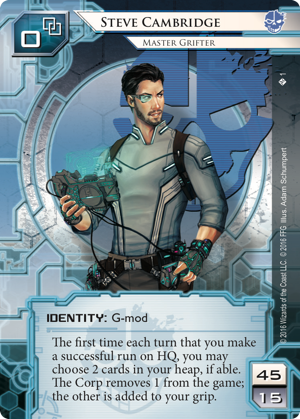 Netrunner puts a fresh spin on the now-classic two player deck-construction-and-dueling genre popularized and dominated by Magic: The Gathering (MtG). It takes the strategic depth of Magic and adds in a substantial bluffing element and high-risk play rarely seen outside of poker. On top of that, it integrates its cyberpunk hacking theme into the gameplay in the most delightful way. Have I suffered 1 brain damage? Potentially. The premise of the game is simple, but the execution is multi-layered and robust. One player takes the role of a corporation in a futuristic world largely controlled by corrupt, global companies. The other player is the “runner”. These hackers, for one reason or another, are motivated to steal information from the corp and to generally disrupt their plans. Within each of those roles there are multiple factions–3 for the runners and 4 for the corps. Within each faction there are a handful of identities. These identities each have special powers that shape the strategy of the decks built with them. Unlike MtG, Netrunner is fundamentally asymmetrical. The game is played to 7 agenda points. And get this–these are corporate agendas, so all of the points are contained within the corp’s deck. Just thinking about that on a conceptual level brings a smile to my face. To score points the corporation needs to install the agenda face down in an outside server (on the table), and then spend money and actions (called “clicks”) to advance the agenda an appropriate number of times before they can score it. The runner can run on any outside servers, or the “central” servers (the corp’s hand, deck, and discard pile) during their turn, and if they find an agenda, they steal it. What’s to stop the runner from waltzing in and taking any agenda they want? Ice. As the corp, these are your cyber-defenses against the runner’s shenanigans. You install ice face down in front of servers. When the runner decides to run into a particular server, they have to first approach whatever ice is in front of it. If you decide to pay to rez the ice (flip it face up), the runner must either suffer the consequences listed on it, or break it using an icebreaker program. Like everything else in the game, a program is just a card in the deck. However, they’re expensive. The runner needs to first draw the appropriate card (there are 3 categories of ice, and thus 3 main categories of icebreakers), then they must pay to install the breaker, and then they have to pay more to actually break the ice. Of course, it can also be expensive to rez the ice, and if the corp can’t afford to do that, then the runner just sails right past it. Or, maybe they can afford to rez it, but doing so will delay their plans for next turn. In this sense, Netrunner is a game of economic management. Everything you do costs money, and running low on money gives the other side opportunities. If the corp has no money they can’t rez ice, and the runner is free to run more liberally. If the runner has no money, the corp can install and advance agendas, knowing that the runner is too poor and unequipped to get past the ice in front of it. Every time you make a decision you have to be aware of the opportunity cost–what possible actions and plays am I forfeiting by spending money here? But economy is not just money in netrunner, it’s clicks. From the corp side, advancing and scoring an agenda inherently sets you back a bit–for most agendas you’ve needed to spend most or all of two turns to score the card, which is money and clicks you did not spend drawing cards, acquiring more money, or building up your network of ice to protect yourself. 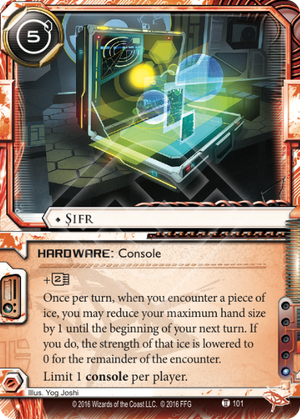 From the runner’s perspective, you can allocate your resources running and trying to find agendas early, or you can work on building up your own “rig” so that you can prepare yourself for a wider variety of ice and increase your chances of finding agendas later on (maybe installing a helpful R&D interface, which will allow you to access two cards whenever you run the corp’s deck rather than one). 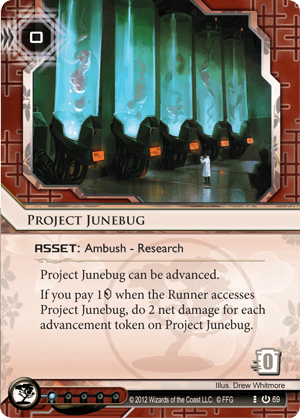 So more broadly speaking, Netrunner is not just a game of economic management, but one of opportunity costs. Fundamentally, every board game that gives the player genuine decisions presents problems of opportunity cost, but it’s rarely so stark as in Netrunner. If we’re to judge games by a simple metric of playtime to number of interesting decisions made, Netrunner must be one of the best games ever made. I don’t think this should be the sole metric by which we judge games, but it’s a salient point to consider. Of course, with the simple interactions and decisions I’ve described so far–creating and protecting servers, finding economic opportunities to exploit, the conflict between improving your own board state and disrupting your opponent’s–haven’t yet considered traps. The corporation has a secondary way to win the game other than by scoring agendas: they can kill the runner. Damage is applied in the form of discarding cards at random from the runner’s hand. If they have no more cards to discard, they are “flatlined” and the corp wins. Some people construct entire decks around the idea of flatlining the runner, and careful runners are always prepared to protect themselves against this. The decision to run into a server can be a matter of life and death for the runner. If they don’t have a full suite of breakers to handle every type of ice, they could easily run right into an Ichi or Cobra, which trashes some of the programs they’ve already installed. Or maybe the corp has advanced a card in a remote server that’s not particularly well protected. Is the play of someone desperately trying to score agendas as fast as possible, or are they trick you into running headfirst into a deadly Junebug? 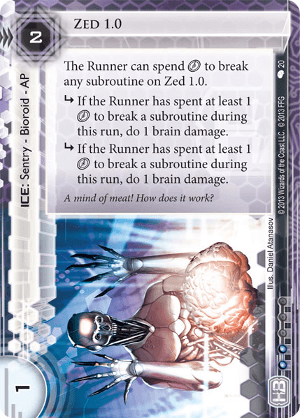 Thus Netrunner is also a game of psychology. This adds an entirely new level of depth to the game. Let’s look as an example at the opening move for the corporation. The corp is always the first side to go, and the typical opening move is to put a piece ice in front of R&D, one in front of HQ, and then to either take a credit or play a card that gives them money. This helps the corp defend their most vulnerable central servers and gives them money to prepare for the next turn. But what if the corp doesn’t do that? Let’s say instead they draw a card, ice HQ, and install a card in a remote server. What does this tell us as a runner? One strong possibility is that the Corp got stuck with multiple agendas in hand and did not have a second piece of ice available. So they protected their hand and perhaps played an asset in the remote server that might help them draw more cards to find the ice they’re lacking. Or maybe they’re so flooded with agendas that they installed one unprotected hoping the runner won’t run on it. Or maybe their deck is built around installing multiple assets, so they actually don’t mind leaving central servers unprotected early. Did the corp player look worried when they played their turn? Did they hesitate to place the cards? Did they mull over the decision a long time? You start to see how intense and involving Netrunner can be. At higher level play you’re also adding in your knowledge of the different factions and possible deck archetypes to the equation, which makes the game that much more challenging and rewarding. 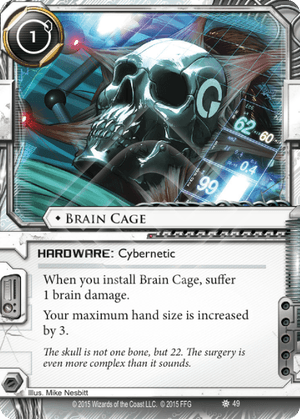 Seriously–a good game of Netrunner will drain you mentally in the best way possible. Of course, the downside to this is that it’s not exactly a beginner-friendly game. Despite being just a card game, I would not recommend this to someone brand new to tabletop gaming. The rules are more complicated than you might expect, particularly when it comes to timing problems–figuring out in what order different card effects resolve. Netrunner doesn’t have the elegance of MtG’s “stack” for this. After study the rules end up making sense, they’re just somewhat obtuse. Fantasy Flight does a decent job of clarifying some of the more obscure card interactions in a frequently updated FAQ document. Also a barrier of entry is the language used in the game. You probably noticed it reading this review. The Corp and Runner use completely different words to describe similar things. For the Corp, their deck of cards is R&D. For the Runner it’s the Stack. The Runner’s hand of cards is called the Grip, while the Corp has HQ. What might be called action cards in other games are Operations for the Corp or Events for the Runner. And so on and so forth. Don’t worry if this text doesn’t make sense. All of this thematic naming nonsense drove me away from the game for over a year. A good friend of mine bought the core set a couple of years ago because he saw it getting good reviews and he loved the futuristic hacker setting. I tried it a couple of times but could not get past the language barrier, so I gave up. Only later did I give it another shot. Somehow some kind of light bulb went off in my head and I started to understand what was going on. I suspect many people will have the same experience I did. The game is overwhelming at first and there’s no easy way to ease into it. But I’m here to tell you to stick with it, because it is absolutely worth it. Now I love that everything is thematically named. Very few games can boast as much narrative immersion as Netrunner, and the barriers to entry are worth it. It feels right to talk about R&D and clicks and brain damage and subroutines and AI breakers. As the runner you feel like you’re a cyberpunk tech whiz trying to stick one to The Man. As the corp you feel like a powerful conglomerate trying to keep a professional face while pesky runners mess with your software in the cyber-realm. This isn’t only the way you speak about the game when you’re playing it. The art in Netrunner is absolutely top notch, and the world Fantasy Flight is creating with every new card release is spectacular. Every time I buy a new pack of cards, I’m just as excited about the short story included inside as I am about the cards themselves. Each one reveals a bit more about this fascinating, vast sci-fi world, and the characters that shape it. Those characters are wonderfully diverse too. Richard Garfield, Lucas Litzsinger, Damon Stone, and whoever else might be responsible for Netrunner’s narrative and art design should be applauded for creating a world that is not only evocative, but one that is full of all different kinds of people–not just stodgy white men. Fantasy Flight should also be applauded for not falling into the temptation of making this a collectible card game like MtG. Instead they’ve used a model they’re calling the “Living Card Game”, in which new cards are released in uniform “data packs”. About once a month a new pack of 20 different cards is released. You buy that pack and you get a full set (three each) of those 20 cards. The cards have no rarity and there’s no drag of buying dozens of booster packs or spending a fortune in the aftermarket to find the one card you need for your deck. You know exactly what you’re getting every time you buy a Netrunner product. Fantasy Flight has also done a decent job supporting the competitive scene with tournament prize kits and a global tournament structure which culminates every year at the World Championships at the Fantasy Flight headquarters. It’s nowhere near as robust as the MtG tournament scene, but Netrunner has only a fraction of the players as Wizard’s of the Coast’s behemoth. There have been a few stumbles along the way with new cards that supported genuinely annoying and unfun deck types, but Fantasy Flight has instituted a “Most Wanted List” that makes cards deemed too powerful more expensive to include in decks. This seems to have done an adequate job at trimming down the power level of individual cards for high-level play. For the person merely looking to dip their toes into Netrunner with casual play, all you need to begin is a Core Set. If you find you like that and want to expand your cardpool, I highly recommend getting the deluxe expansion packs. Each one gives you a host of new cards for one runner and one corp faction, so you can buy the packs that fit the factions you like. After that, if you want to start becoming more competitive, you can look at buying up some data packs, and additional Core Sets. Because there is only one copy of some key cards in the Core Set, the very serious player will want to end up with at least two Core Sets. This bumps the price up for those players, but Fantasy Flight will begin rotating out data packs later this year to limit the size of the competitive card pool. While it’s still expensive to acquire a complete competitive set, it’s not nearly as much money as it is in other, similar games. I wholeheartedly recommend Android: Netrunner. While the learning curve is tough at first, if you give it a little bit of effort, you will be rewarded immensely. Very few games can boast this level of thematic excitement with such deep strategic and tactical gameplay. I’ll be playing it for years to come.